You know, I think a shawl might be the only major knitwear category missing from my design portfolio? Hat, mitts, socks, scarves, cowls, sweaters and T-shirts – all of those. Pavonis and Pravigan both have strong shawl-like qualities. But no actual shawls. And even with this, my contribution to the 2018 Knitting Goddess Shawl Club, in retrospect, I think Zivatar was really more of a scarf. Albeit a fancy-shaped scarf. It’s fun to knit like a shawl, though. You’re probably familiar with the asymmetrical triangle format: start at a point, increase on one side and decrease on the other at different rates, cast off when it gets big enough. Satisfyingly easy and adaptable, and very wearable. Zivatar doesn’t do anything radical with this formula – it increases gently so that the result is a smidge longer and narrower than usual, that’s all, and uses a fun sawtooth edging on one side. The fun comes from alternating plain garter stitch bands with various simple lace patterns. And from changing the colour with each band, with a dramatic, wildly coloured contrast at the end to liven things up. I had the pleasure of coming up with the entire concept for this and requesting colours to suit. My inspiration was an afternoon thunderstorm: the darkening light, the storm building from scattered raindrops to wild lightning, and finally leaving the air clear and sparkly. (Maybe you’d like to add a few beads to that final, silvery, openwork band?) 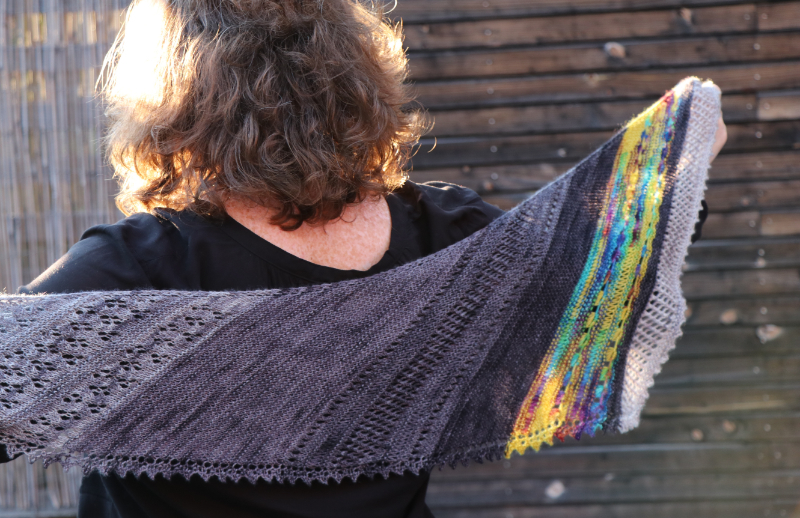 Elongated stitches make the most of that gorgeous rainbow skein, with the semi-solid greys adding a sense of shifting light to those slightly textural lace bands. Zivatar is now available in my Ravelry store, and Joy has dyed a batch of the “magnificent seven” mini-skein sets to make exactly as shown. If you too love thunderstorms – I hope you love this!